Netflix is sponsoring Entertainment Weekly's Oscar Pool, and you can cast your vote here. You can win an "all-expense paid weekend in Hollywood to watch your favorite stars arrive at the 79th Academy Awards® in 2007! Seated in the Red Carpet arrival area, you will be able to watch as the stars strut for the cameras and the fans! Plus, lots of other great prizes!" Joe sent in a Wall Street Journal story that says Warner Bros. is experimenting with content distribution using peer-to-peer technology in Germany. Warner Bros. is working with Bertelsmann AG and its subsidiary Arvato to create a service called In2Movies, to launch in March. The service will feature movies dubbed into German, including "Batman Begins" and "Harry Potter and the Goblet of Fire," for a fee that Warner says will be similar to the cost of a DVD. It will also offer television shows like "The O.C." and locally made programs and movies. The nominees for the 78th Annual Academy Awards have been announced. Since 1995, with the release of "Toy Story," Pixar's films have reinvented the art of animation, won 19 Academy Awards and grossed more than $3 billion at the box office. But the secret to the success of Pixar Animation Studios is its utterly distinctive approach to the workplace. The company doesn't just make films that perform better than standard fare. It also makes its films differently — and, in the process, defies many familiar, and dysfunctional, industry conventions. Pixar has become the envy of Hollywood because it never went Hollywood. paidContent.org wrote an excellent summary of a Hollywood Reporter story about the money behind video downloads from Apple and Comcast. According to JPMorgan Chase analyst Spencer Wang, one-episode of a hit show on network TV would generate about $12 million in gross ad revenue (assuming 17 million viewers). By comparison, even in the worst-case scenario -- with 20% of TV viewers opting for downloads, 100% of which overlap with existing programs -- downloaded episodes of such popular series can generate an estimated $15 million in revenue. The main reason is that the $1.44 in download revenue per user (or 70% of the $1.99 per download) is greater than the estimated 57 cents in advertising revenue per user generated under the current model. Click here for the full list of new releases this week (101 movies). Interesting movies this week include Legend of Zorro, In Her Shoes, Corpse Bride, The War Within, Bubble, Curse of the Pink Panther, Da Vinci and the Code He Lived By, Hill Street Blues: Season 1, and Captains Courageous. I’m getting sick to death of the increasingly HIGH percentage of scratched -- and thereby unplayable -- DVD’s I’ve been getting from Netflix. Some look like they’ve been left on sandpaper. Some (and this really chaps my hide) wait until halfway into the movie before the screen digitally flutters…then jumps WAY back to an earlier scene, or just stalls altogether. 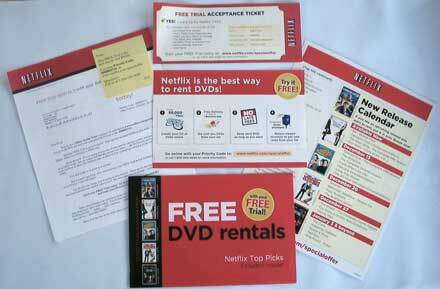 What is your experience with Netflix rentals? How many scratched or unplayable movies have you received lately? The strategy didn't result in much excitement about the film in theaters. "Bubble" took in an estimated $72,000 at the 32 screens where it played -- an average of $2,250 a screen. The movie was largely shunned by theaters, which rely on the usual gap between the theatrical release and the DVD release to give them an exclusive play period for each film. "Bubble" is showing mostly at Landmark Theaters, a chain owned by "Bubble" producers Mark Cuban and Todd Wagner, plus a handful of independent movie theaters.